With the flavors of chipotle, lime, and cilantro this Southwestern Cauliflower Salad Recipe will be one of the best things you have ever eaten. 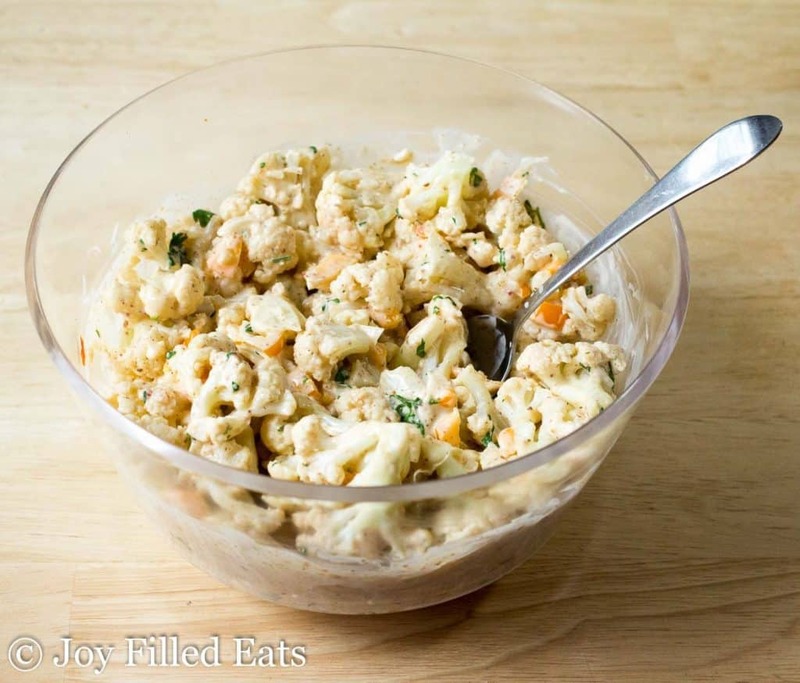 You won’t miss real potato salad once you try my Spicy Cauliflower Potato Salad. This Southwest Cauliflower Potato Salad Recipe seriously was one of the best things I’ve ever eaten. If I didn’t have other people I needed to feed I really would’ve stood barefoot in my kitchen and eaten the entire bowl. I think it was even better than the potato salad I based it off of. No offense Mr. Flay. 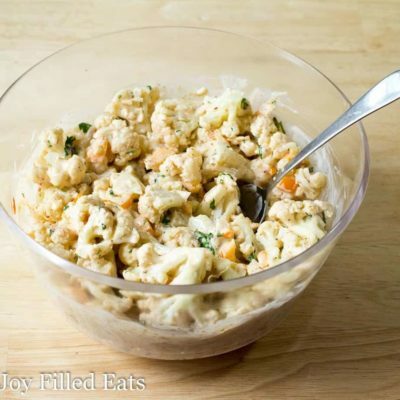 My Spicy Cauliflower Salad Recipe is inspired by one of my favorite potato salad recipes ever. Bobby Flay’s Mesa Grill Potato Salad. I’ve never been to Mesa Grill and I don’t even own the cookbook this recipe appears in. Many, many years ago I was a nanny for about a year. The family I nannied for were foodies in the process of opening a restaurant the year I worked for them. They had a large assortment of cookbooks I used to peruse and jot down intriguing recipes. This is one I’ve made ever since. I’ve made a bunch of tweaks to appeal to my family’s taste buds and subbed steamed cauliflower for the potatoes to lower the carbs but the flavors of chipotle, lime, and cilantro still stand out. Is cauliflower healthier for you than potatoes? I think so. One cup of chopped cauliflower has 5 grams of carbs. One cup of diced potatoes has 26 grams of carbs. If you are watching your carbs while on a keto or low carb diet or doing Trim Healthy Mama than cauliflower is a better choice than potatoes. I’m not going to lie. I have very sensitive taste buds. If you put mashed potatoes and mashed cauliflower in front of me I know which is which. 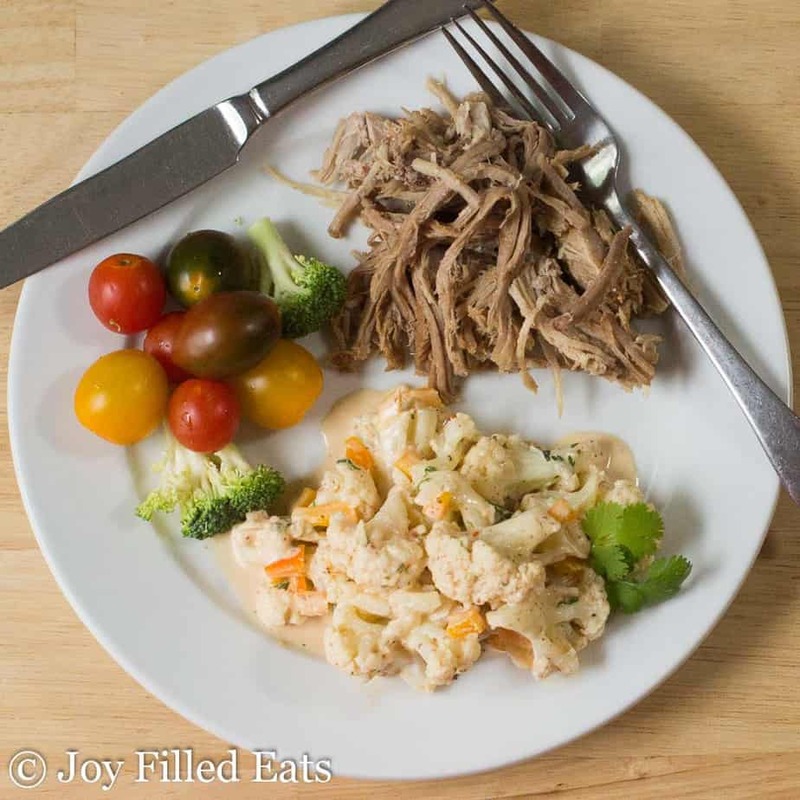 But I have come to enjoy using cauliflower in place of potatoes in many recipes like this cauliflower potato salad. I chose to use cooked cauliflower in this cauliflower salad to better mimic the texture of cooked potatoes in a potato salad. 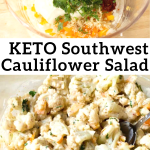 But if you like the crunch of raw cauliflower you can definitely use that instead and make a raw keto cauliflower salad! Either method will work for my spicy cauliflower potato salad. You can even shred the cauliflower stalks and turn this into a keto cauliflower slaw. Having chipotle puree in my freezer is a necessity. It takes me about a year to use the 7 oz of puree you get from one small can but when I want a little heat and a little smoke it’s perfect. I stir a bit into mayo quite often to make a quick chipotle mayo for lettuce wraps and sandwiches. It is an easy way to dress up a pantry staple. 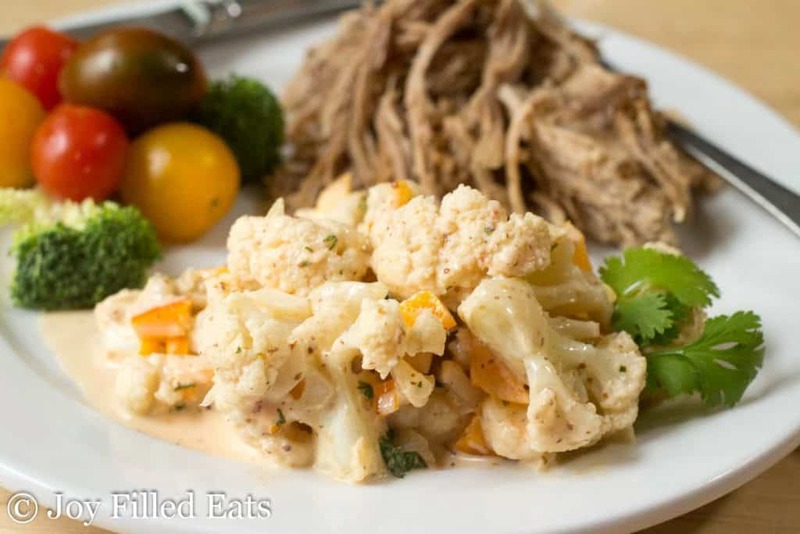 To make a delicious chipotle sauce simple mix up the dressing ingredients for this cauliflower salad recipe and use it however you like! With the flavors of chipotle, lime, and cilantro this Southwestern Cauliflower Salad Recipe will be one of the best things you have ever eaten. Steam the cauliflower for 6 minutes in a large covered pot with about 1/2 inch of boiling water in the bottom. Drain and cool to room temperature. Meanwhile, stir together the mayo, mustard, lime juice, garlic, chipotle puree, and salt. Stir in the cilantro, onion, pepper, and cooked cauliflower. Serve at room temperature or chill in the refrigerator. *** To make the chipotle puree simply blend a can of chipotles in adobo in a small food processor. This freezes really well. I freeze it in 1/2 tablespoon portions in an ice cube tray so I can take one out when needed. Originally Published June 20, 2017. Revised and Republished April 24, 2019. 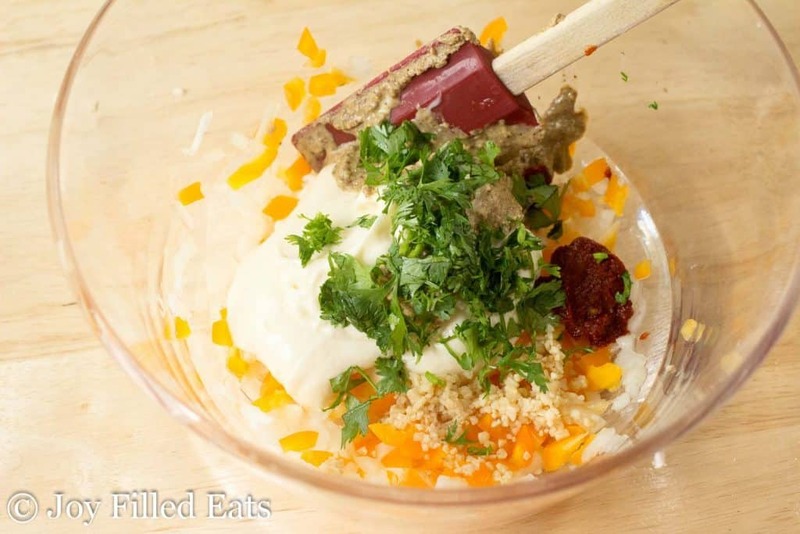 What a yummy way to enjoy cauliflower! This is my new favorite cauliflower dish!!! WOW! Amazing! Thanks for sharing!!! Is there another seasoning you could recommend if you don't want to use the chipotle? I was out of chipotle recently and subbed in tomato paste. It worked pretty well but this dish gets much of its flavor from the chipotle puree. I do recommend trying it at least once. 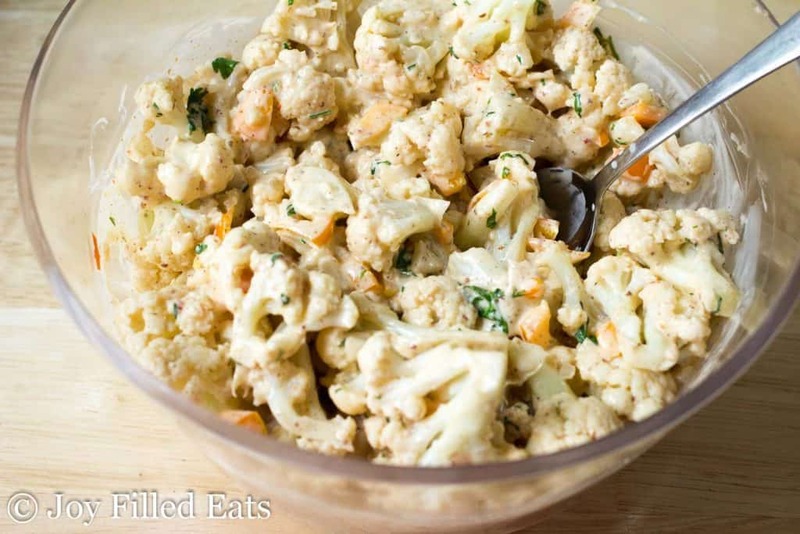 Chipotle is a wonderful addition to this cauliflower salad! This will be a great side dish to share at a potluck. 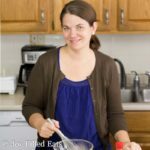 Pinning and bookmarking your recipe so I can make it this weekend. If you used low fat mayo or greek yogurt instead of the full fat mayo, would this qualify as a fuel pull for THM? You would have to check the nutrition facts but I think it could.